Quel suprise yet another book with "girl" in the title. Surely this will be amazingly brilliant like all the others, well, Stephen King has said that this book is "The first great thriller of 2017" and who am I to argue. This book is going to be huge. I don´t think the current blurb does it justice, its a great story that is written so well. This is Riley Sagers first book and if this is anything to go by we are in for a treat over the coming years. There are two stories here. 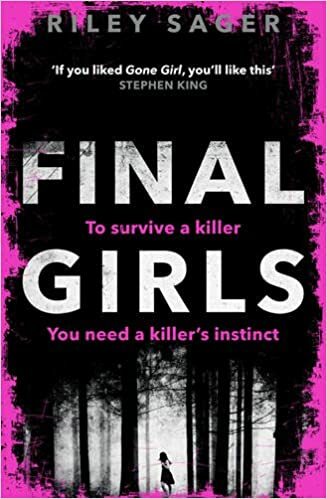 As Quincy remembers the details of the missing hours, We hear the story of what really happened at Pine Cottage and the story of the three Final Girls, Quincy, Sam and Lisa. Both stories will keep you on your toes and are full of tension with both converging in a fantastic ending. The possible outcomes of this story are all hinted upon and you are never sure which avenue Riley Sager is taking you until you get there and for me it wasnt expected.